If Pad Thai is the national dish of Thailand, ต้มยำกุ้ง Tom Yum Goong must surely be the mother of all Thai soups. Being sour and spicy at the same time, it is perfect to whet one’s appetite, be it under the gruelling summer heat, or against a drab and grey rainy day. Like many dishes in Thai cuisine, a good Tom Yum is characterised by the liberal use of herbs and aromatics, not to mention those fiery bird’s eye chili, much loved and hated at the same time, as the melange of flavours explode in our mouths with each sip. Throughout the years, according to David Thompson an Australian chef renowned for his interpretation of Thai cuisine Tom Yum Goong has evolved somewhat, with some of these innovations bringing the soup to greater heights, some acceptable while others lesser so. This ubiquitous classic, found all over the country from posh michelle-star restaurants like Thompson’s very own Nahm to street food stalls which line the lines banks of the Chao Phraya, has been interpreted and reinterpreted by many. 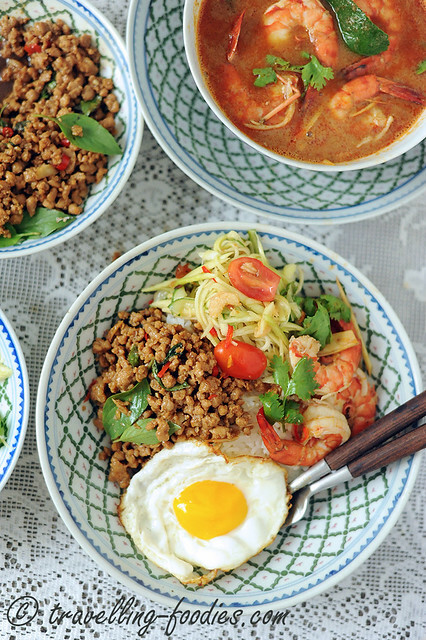 It is a must-order for anyone who walks into any Thai restaurant all over the world, an epitome of Thai food, and most definitely the 101 dish for anyone who is broaching the cuisine for the very first time. Some food critics have even gone on to push Tom Yum Goong as a personification of the Thais, with all its piquant flavours reflecting the multi-faceted personalities of the people, though I find this notion rather cloying. One thing I’m in full agreement however, is how delicious Tom Yum Goong can be, when it is made well, allowing one to taste a bit of everything all at once, for one who is in for an enriching gastronomic experience. 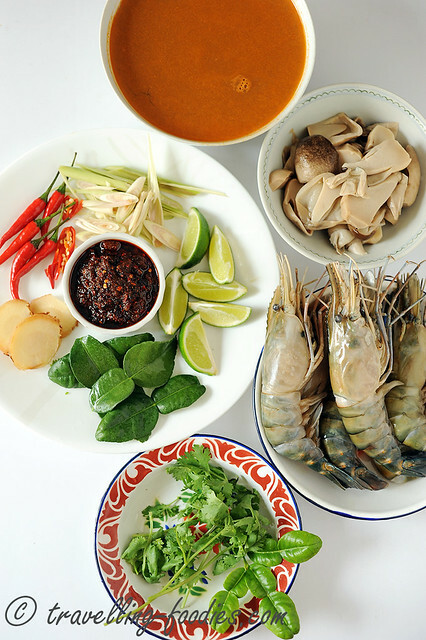 The base for Tom Yum is a standard protocol of ingredients which are common throughout Thai cuisine. Lime, lemongrass, kaffir lime leaves, galangal, coriander leaves and bird’s eye chili form the basic core of the soup from which its strong flavours are drawn from. Straw mushrooms are often added as a supplement though oyster mushrooms or even canned button mushrooms are reasonable substitutes. “Tom” means to boil while “Yum” is indicative of the concoction of spices and herbs used the soup, both derived from words in the local tongue. 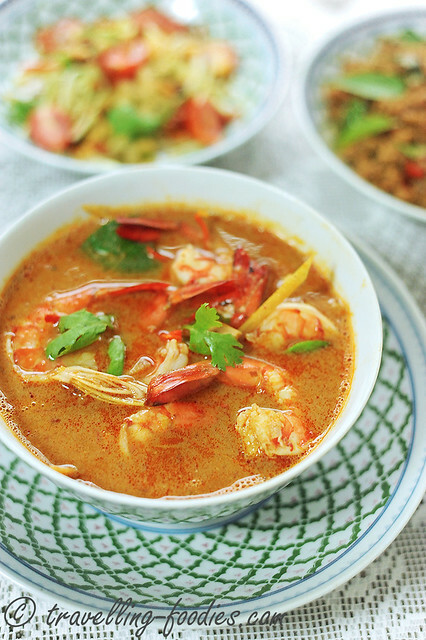 “Goong” means “prawns” in Thai, the mostly popular version of this soup though one can easily extend the palate sensations through the use of other seafood like squid, fish, clams as well as chicken. 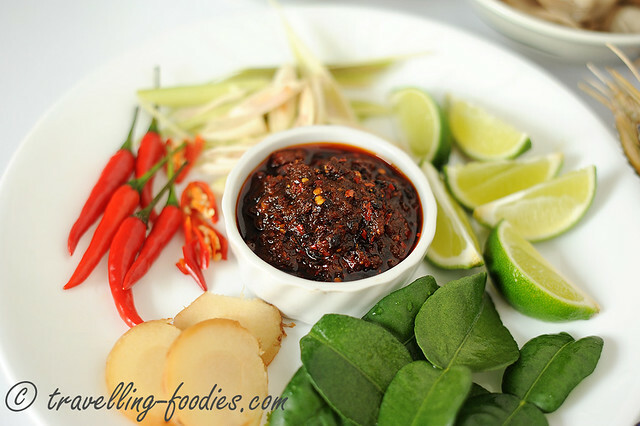 The complexity of the flavours taps not only from the fresh herbs and spices used but more importantly, a carefully concocted chili jam known as น้ำพริกเผา “nam phrik phao” , cooked down in to a paste from roasted dried chilies, shallots, tamarind pulp, dried shrimp, garlic, fermented shrimp paste and Thai palm sugar. Every Thai grandmother has her own family recipe, mostly similar though differing in ratios depending on the desired levels of heat, saltiness, sweetness and sourness one’s family prefers, not to mention a secret ingredient or two here and there. If it is not available from where you are, simply replace with an equivalent amount of dried roasted chili powder or simply omit altogether. Apart from the ingredients above, the soul of a good Tom Yum is actually a good soup base, usually homemade prawn stock or chicken stock. I prefer the taste of the former, which is richer and more aromatic as it helps provide this simple soup with much lift of flavours. 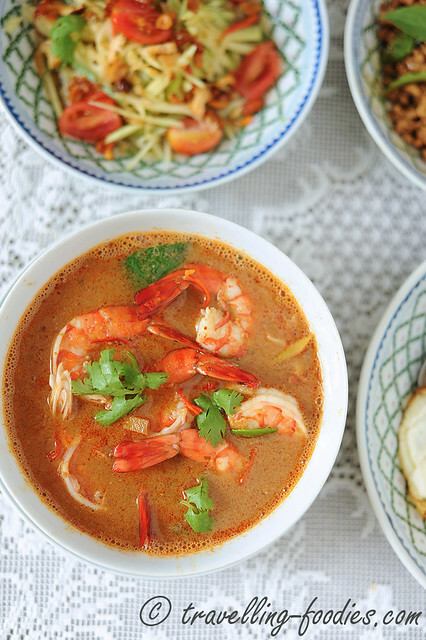 The prawn soup base is prepared from first sauteing prawn shells in some oil to release the astaxanthin locked in those orangey red exoskeletons, further extracting into the liquids from extended boiling, followed by steeping. 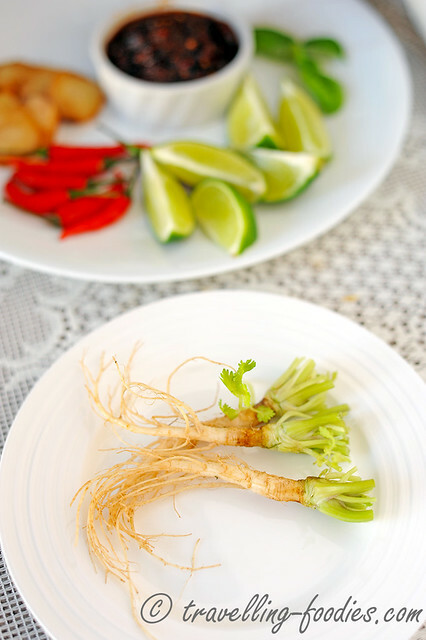 An interesting ingredient which one will find in traditional Tom Yum Goong is fresh conriander root, pound and crushed briefly using the mortar and pestle together with the lemongrass, chilies and kaffir lime leaves to release the flavours and aroma from within. First bruise the galangal, lemongrass, kaffir lime leaves, bird’s eye chili and coriander root with mortar and pestle. The kaffir lime leaves can also be torn to help release more flavours. 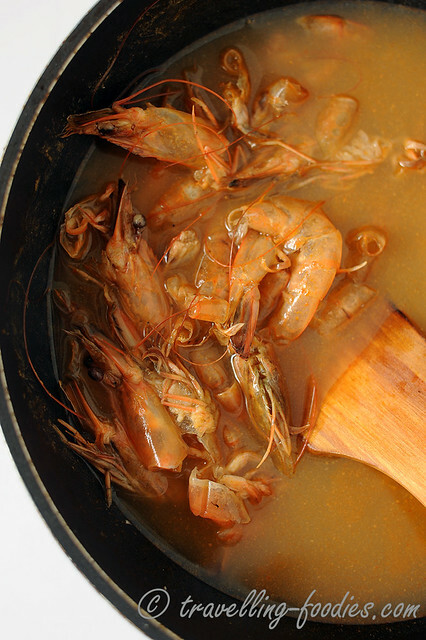 To prepare prawn stock base, add 200-400g of prawn exoskeleton to a hot wok and pan fry over medium low heat with 1 tbsp of oil until they turn orange and fragrant. Add the bruised ingredients and stir fry quickly before adding 1.5 litres of hot water, increase the flame and bring the mixture a boil before lowering to simmer with lid covered for about 10 min. Turn off flame and allow the stock to steep for 30 min or so. To prepare Tom Yum Goong, first drain the hot prawn stock from the wok into a saucepot. Discard prawn exoskeleton but keep the other crushed ingredients in the stock if desired. Add thai palm sugar, fish sauce, salt and lime juice. Stir to dissolve before bringing to a boil. Add straw mushrooms and fresh prawns and cook until the prawns just turn pink which should take no more than 2 minutes. Adjust the flavours with more sugar, thai fish sauce if necessary. Turn off flame and ladle into a serving bowl. Refresh the soup with a spritz of more fresh lime juice and garnish with chopped coriander leaves, kaffir lime leaves and fresh bird’s eye chili. This entry was posted on May 5, 2015 by Alan (travellingfoodies). 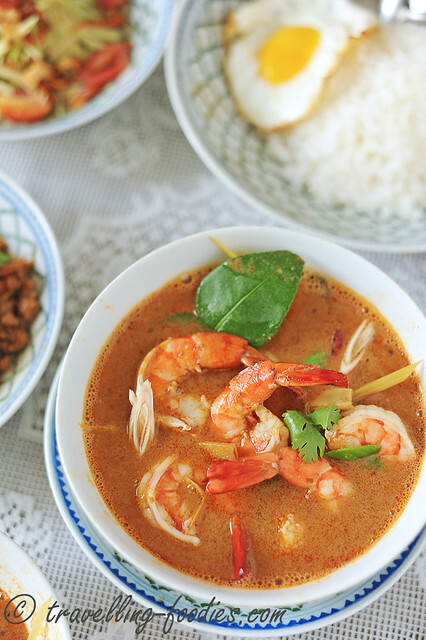 It was filed under Food, Simple Eats and was tagged with bird's eye chili, chili flakes, chili jam, chili padi, chili pastr, coriander root, kaffir lime, lemongrass, limes, Nam phrik phao, prawn stock, seafood, thai cuisine, thai spicy and sour prawn soup, tom yum goong, tom yum soup. Never knew coriander root is being used in Tom Yum soups, I also prefer a prawn stock to a chicken stock, they have a stronger umami taste! Love the photos! It didn’t have the word yum in it for nothing. Absolutely my favorite Thai food!